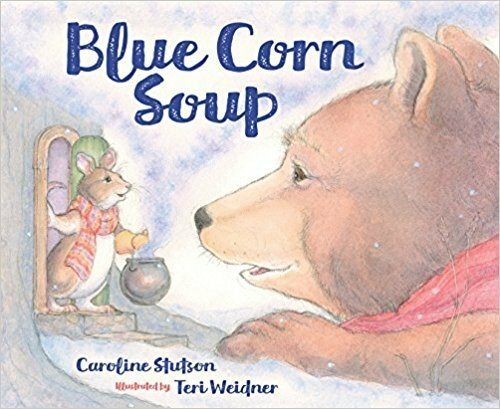 What better way to usher in a new school year than with this beautiful tale about friendship and sharing, written by Caroline Stutson and illustrated by Teri Weidener? As snow begins to fall in the canyon, Mouse knows just what will keep her warm—blue corn soup. As the soup starts simmering, her neighbors catch the scent and hope to share. There isn’t nearly enough blue corn soup for everyone, but Mouse has an idea that will keep them all toasty, their bellies full, and will make friends out of neighbors. Caroline and I were in the same critique group for a number of years. As well as sharing our work online with the group, Caroline and I would also meet up on our own every so often. We swapped stories about our most recent school visit, or commiserated with each other over the latest rejection letter, or enjoyed a chuckle over the antics of our dogs. Caroline passed away in 2015 without knowing that Sleeping Bear Press had accepted this story for publication. How I wish she could be here to celebrate the release of this wonderful tale, but still, I like to think she is enjoying her very own celestial merry making! Her grandson, Alec Stutson, who is also her Writing Apprentice, sums it up best in his dedication. Ah…and so it is…Caroline’s words still live in our hearts, touching us with goodness, grace, and light, as she herself did with her life.